Dayton native Erma Louise Fiste was only thirteen years old when she wrote her first newspaper column, which appeared in the Emerson Junior High School Owl. While her childhood was hard -- her father died when she was nine -- Erma Fiste prevailed. Though her mother had hopes of turning her daughter, a gifted singer and dancer, into "the next Shirley Temple," Erma knew early on that she would become a writer. That dream grew as Erma attended high school; while there, she wrote a column for the student newspaper. At fifteen, she managed to get a job as a copygirl for the Dayton Herald newspaper. At this time she met Bill Bombeck, who was a copyboy on the morning paper, the Dayton Journal. Upon high school graduation, she mostly wrote obituaries for the newly-merged Journal Herald. After a year, with enough in her savings account, Erma attended Ohio University in Athens. 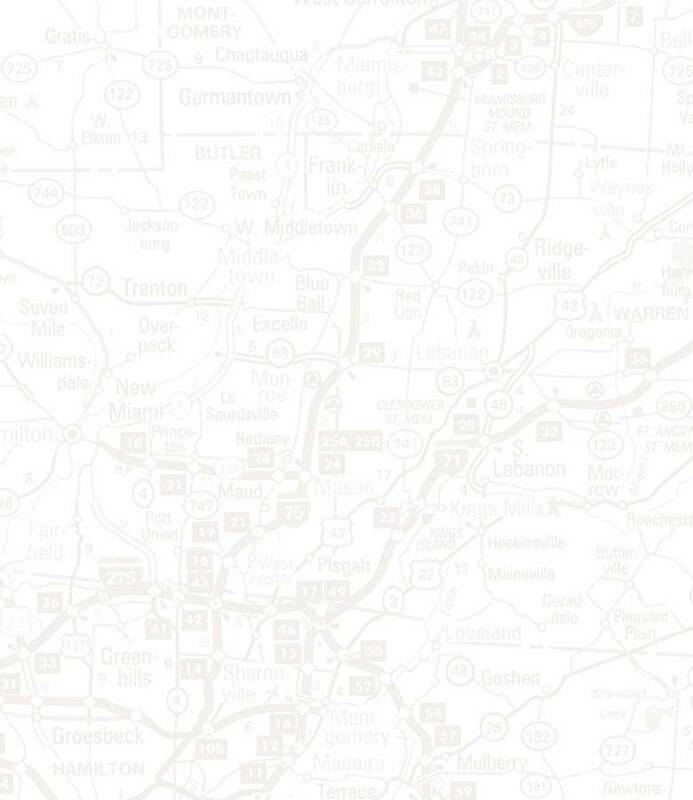 Her stepfather was in the Army overseas and her mother insisted that she return to Dayton. She enrolled at the University of Dayton, where her writing was recognized and encouraged. Upon graduating from the University of Dayton with a Bachelor of Arts degree in English, Erma signed on with the Journal Herald as a staff writer. Bill Bombeck also attended the University of Dayton. They married in 1949. Erma continued working at the paper for four years before leaving in 1953 to start a family. Mrs. Bombeck tended to the necessary, yet mundane, chores of homemaking and motherhood. While she didn't plan to return to the newspaper, her need to write led her to the Dayton Shopping News. There her wit and "household" wisdom provided her with the fodder for a column. In 1963, the year she sent her youngest off to school, Erma eagerly jumped back into her former career, saying: "I do not feel fulfilled cleaning chrome faucets with a toothbrush. It's my turn." Yet it would be her humorous view of housework, home and family that would make her famous as every woman's alter ego. Knowing the tedious and often lonely plight of the homemaker firsthand, Mrs. Bombeck decided to direct her writings this time around to the stay-at-home mothers of Dayton. A local weekly paid her $3 for each humorous column; as its popularity increased, she was courted by her former employer, the Journal Herald, to continue the column there for the meager, but improved, fifteen dollars per week. In 1965, Erma made the move. Thrilled by the column's popularity, Journal Herald publisher, Glenn Thompson, submitted it for national syndication to Newsday. They offered Mrs. Bombeck a short-term contract. At first, her column "At Wit's End" appeared in thirty-eight papers across the country. Five years later, over 500 papers had picked it up. Erma Bombeck spent the next twenty-seven years writing first newspaper columns and then books that touched the lives and hearts of not only American women, but an international audience that included men and children as well. She achieved the pinnacle of her career with 1976's The Grass Is Always Greener Over the Septic Tank, which "sold over half a million copies in hardcover and stayed on the bestseller lists for over ten months." It was also made into a TV movie. During the first part of her writing career, Erma traveled the country, speaking to the many people who laughed out loud as she described the joys and foibles of everyday life. She undertook another mission, one she felt was critically important, when she made appearances nationwide to support the passage of the Equal Rights Amendment. While a staunch supporter, her political views were never voiced in her column. Erma's career thrived in print, and took her to television. Starting in 1975, she did humorous features and interviews for ABC's Good Morning America program, which turned out to be an eleven-year commitment. Erma Bombeck continued writing and publishing right through a number of serious health problems in the early 1990's, including a bout with breast cancer and another with kidney disease. In 1996, though, she lost her battle with kidney disease and died. Thirty-one years of syndicated columns, twelve books, eleven years of televised appearances on Good Morning America, and sixteen honorary doctorate degrees later, Mrs. Bombeck earned a place in American history as the heroine of a group few others ever care to address: homemakers. "My type of humor is almost pure identification," said Erma. "A housewife reads my column and says, 'But that's happened to ME! I know just what she's talking about! '�Basically women work alone when they're at home. They think no one is feeling what they are feeling, that no one understands their daily frustrations. But we do; we all do." Photos courtesy of the Bombeck family. 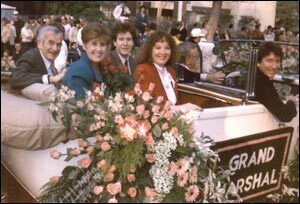 Top: Grand Marshal Erma with Bill, Betsy, Matt and Andy Bombeck, 1986 Tournament of Roses Parade. 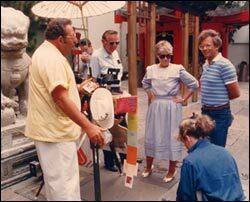 Middle: Erma and crew at Good Morning America shoot, Grauman's Chinese Theater, Hollywood, CA, 1986. 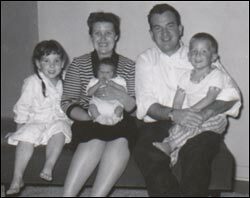 Bottom: Erma, Bill, Betsy, Matt and Andy Bombeck, 1958.